A pickup installed in your ‘ukulele or a microphone that will pick up the sound. An amp or PA to make the signal louder than life. There are many, many ways to get from point A to point B. I’ll cover the basic concepts here that you might want to know as you start using amps to plug in your uke. The trusty amplifier is an all-in-one unit that contains the amp circuit that makes the sound louder, the channel controls, EQ, and a speaker to get that sound out into the air. Plug a cable into your ‘ukulele and the amp and you’re ready to go. It’s a simple setup that is great for small solo gigs. A “combo” amp. The main type that most people use. It has everything you need in one box. A head/cabinet amp. This is a two part amp that has a smaller box (the “head“) that does not contain speakers – just the amp circuit and controls – and a speaker cabinet that has a speaker (or four), but no circuitry. A speaker cable connects the two getting the power from the head to the cabinet. It’s likely you could find more power in this style amp. 9 times out of 10 a combo amp will be your best bet, but if you’re looking for a unique setup you can check out head/cabinet options for more power, weight, and visuals. There are few, if any acoustic instrument specific amp heads on the market, but you could easily use a bass head to get a clean ‘ukulele sound. An amp can have any number of speakers in it. The speakers themselves are cones housed in a solid shell. There is a cone attached to a big magnet that turns on and off very quickly. The vibrating of the magnet moves the cone, and likewise the air, making sound waves. A big speaker is called a woofer or a driver. The bigger diameter a speaker has the more defined the bass response. Small speakers are called tweeters. They produce lots of treble, but little bass. A driver and tweeter combination are often used to get a more balanced sound using the best of both worlds. How many watts an amp has gives you a ballpark idea of its power and loudness. Having more watts gives you more potential power and room for the signal to open up, giving you a stronger sound. Clean headroom is how much volume you have left on tap before the amp distorts. Since most of the time you will want a clean sound for your ‘ukulele, the more headroom you have the better. For example, crank a 30 watt amp up all the way and it will start to bog down. But if you were playing a 100 watt amp at the same volume you would likely have much more headroom and the signal would cleaner. Some great information and mental pictures explaining the concept from ONVI Labs. A tube amp is an amp that use vacuum tubes in its circuit to boost the signal. This is the old style of building amps and is said to have a more warm, natural sound than solid state. For an ‘ukulele it’s a questionable selling point; tube amps are more expensive and heavy than their solid state counterparts, not to mention sort of an unknown factor when used with ‘ukulele. Reason being: there are few, if any acoustic instrument tube amps. That said, I’ve used a fair share of electric guitar tube amps with varying degrees of success. A solid state amp uses transistors to boost the signal for a pristinely clean sound. Most acoustic amps on the market are built this way since clean sound reproduction is a major goal. An amp sometimes has an effects loop which allows you to plug your ‘ukulele directly into the amp and then add effects pedals into the signal by patching them into the amp circuitry. This allows the amp to react to your plain uke sound (which can often sound better) instead of dealing with impedance and buffer issues brought in by pedals. Only something to worry about if you’re a big gear nut (you’ll know if you need one) or you’ve already got one to play around with. A PA is a set of components that work together to create your sound. It usually consists of a mixing board (mixer) and at least two speakers. Yamaha’s line of powered mixers is a good example of this type of PA.
1. A powered mixer paired with passive speakers. This is the simplest setup with the least amount of moving parts. The amp is built into the mixer and this powers two or more speakers via heavy-duty speaker cables. Because of the design, a powered mixer is often mounted upright on a vertical panel instead of flat like a tabletop. This type of PA is usually cheapest and easiest to use. Number of cables to plug in: 3 – power, speaker cable (x2). A passive Allan & Heath mixer with an active QSC K10 speaker would be an awesome type 2 ‘ukulele PA! 2. A passive mixer paired with powered (active) speakers. This means no amplifying power is generated at the board; it simply mixes the signals together and sends them on their way. This requires additional power from an outside source. Active speakers have amplifier circuits built into them and they plug into a wall plug. They can be connected to the mixer via plain XLR or instrument cables since these are not carrying power; just the signal. More and more people are moving to this option because of flexibility and reliability (not having all your eggs in one basket). Number of cables to plug in: 5 – mixer power, speaker power (x2), signal cable (x2). 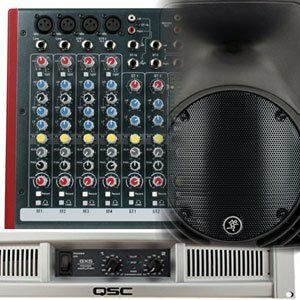 Add a QSC poweramp to power a passive Mackie speaker and you’ve got type 3. 3. A passive mixer with an outboard amplifier powering passive speakers. This last option operates similar to the previous, but instead of self-powered speakers, an outboard amplifier unit sends power to passive speakers. This is a complex setup with the most parts, but it can easily be the loudest out of the three. Pro sound guys and house systems usually go this route. 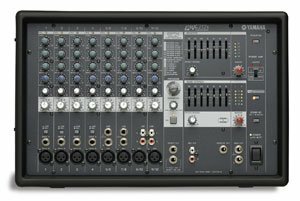 Number of cables to plug in: 6 – mixer power, amp power, signal from board to amp (x2), power from amp to passive speaker (x2). Most amp or mixer controls will be organized by channels. A channel is a control set that can accept the signal from a single source (or possibly two if the channel is “stereo”). For instance, you might plug a mic into one channel and your ‘ukulele into another. This would allow you to have control over the volume and other aspects of each sound source. An amp will usually have one or two channels – much less than a mixer, which might have 4, 8, 12, 16, or more. A 1/4″ instrument cable input is considered “unbalanced.” This means there are two wires inside it: a signal wire and a ground wire. This tends to pick up a lot of outside noise. A “balanced” XLR plug however, has three wires (two signal, one ground) that effectively cancel out any interference noise that might be collected along the length of the cable. This means that while 1/4″ instrument cables are good for short lengths (less than 20′), XLR cables can be used for long runs without any loss of tone or extra noise. If you have the option, use an XLR cable. If you don’t, make sure to keep your 1/4″ cables short. If you can’t reach where you need to go with a 20′ instrument cable, you’ll have to use a direct injection (DI) box to convert the unbalanced signal to a balanced one for the rest of the way. One other common input type is the stereo RCA jack. Familiar to home audio people, these are double cables with a red plug and a white plug. These are used for plugging in an iPod or CD player. The ghost in the machine! It sounds like it should be a lot cooler, but phantom power is really very basic. If an amp or mixer has this feature, you can send a 48V current via an XLR cable to a phantom-power-compatable piece of hardware (usually a condenser microphone or DI box). This means no batteries or extra power cables. Many higher-end mics won’t work without phantom power. The volume at which a signal enters the amp or mixer circuit is called the input volume. How “hot” a signal is upon entering the channel affects how well optimized it is for the subsequent controls and final sound. The gain is controlled by a knob that is sometimes labeled “trim” instead of gain. Trim leads you to think “trimming back the sound” to reduce the volume – rightly so. But on the majority of units the gain/trim is linked with a preamp to boost a soft signal. Turning up the gain will hugely increase the volume of the source, but push it too far and the sound will distort, or “clip.” You want to find a happy medium to get the best bang for your buck minus distortion. Controls the tone of the channel and how loud or soft certain frequencies are. EQ is usually controlled by knobs that, turned clockwise, boost the frequency, or, turned counter-clockwise reduce the frequency. There are three main frequency ranges: bass, middle, and treble. Bass controls the low frequencies like a bass guitar’s rubble that you “feel” more than hear. Middle frequencies span a huge range, but affect things like the clarity in a voice or the boomy sound an ‘ukulele can get when plugged in. Treble is home of the high frequencies – the “shimmer” of the music that gives it an airy feel or “life.” Since the mid-range is so wide, you’ll often find something called a “parametric EQ” on a channel. This allows you to control the boost and cut of the mids, but also where the peak of the frequency is centered. This is one of, if not the, best tool to have when fine tuning your sound. Almost any frequency problem can be fixed to a certain degree with a parametric EQ. Not so with “fixed” EQs that only control a fixed range. A PA-specific knob that changes the balance of the signal between the left and right speakers. At center the signal comes out of both speakers at even volume. Turn it one way or the other and the sound leans to one side until it’s maxed out, only coming out of one speaker. A switch that silences the channel from the main output. On some mixers this is an “ON” switch that works the opposite way. This controls the final volume of the channel sent to the master bus. (PA-specific.) A solo switch is an inverse mute button; it mutes all channels except the one that is soloed. Sometimes this allows the signal level to be shown on the main visual level bar or monitored in headphones. The last control leaving the amp or PA that turns the volume of ALL channels up or down. On an amp the main output is the speaker. On a PA the “mains” are usually a left and right stereo pair of XLR or 1/4″ outputs for running to your speakers. When you can, use the XLR outs for a cleaner sound. When you can’t, go 1/4″. A line-level signal for connecting an amp output to a PA input or for sub-mixing from one mixer into another. You can also use this as a recording send, though often a recording-specific signal is also provided via a pair of RCA outs. A “cans”-specific output that allows you to plug in headphones without blowing your ears out. This is great for quiet, practicing with an effected sound or, on a PA, for monitoring your channels in a more isolated way. Similar to an effects loop on an amp, an auxiliary send on a PA gives you the option of sending a channel to a separate bus output with its own volume level. This is used to feed monitor speakers that often need a separate mix to sound best for the musicians. It can also be used to send several (or all) of the channels to an effects unit. This is fed back into the mixer via an “aux return” jack. All that said, here are the amps I would recommend first to somebody. My conclusions are from my own experience and the general ‘ukulele public’s consensus. Some of the most respected brand names are: Fishman, Roland, LR Baggs, AER, SWR, and Fender. The Roland Micro Cube has always been a favorite for an entry-level uke amp. But because it’s an electric guitar-oriented piece of gear, I’ve found it over-processes the clean signal, even on the “acoustic” setting (which is actually meant to make an electric guitar sound acoustic). That said, I’ve had mine for well over 10 years and it still works. I replaced the speaker many moons ago which was a huge improvement in the overall sound. On The PA side, your entry level price is going to be much higher – you get what you pay for. There are lots of cheap systems and you’ll see people recommend something like the Kustom PA40 for simple applications, but the quality I would hope for doesn’t show up until you get to a price-point 3x that much. My friend that I gig with a lot has been running a Yamaha Stagepas 400i. It’s okay. Does the job, but even so at $700, it’s really only charming because our sound is intentionally lo-fi and we’ve been gigging in crazy conditions with crappy PA systems for years. Right now, as far as I’m concerned, the Fishman Loudbox Mini is the best thing going under $500. It screams for its size (and $329 pricetag!) and has a mic channel for solo gigs. For PAs, a Yamaha EMX512SC paired with some no-name passive speakers would get you a small bump in quality from the Stagepas level. AER builds the holy grail of acoustic amps. I’ve never played through one with an ‘ukulele, but if you know, you know. A friend of mine uses a Compact 60 for his steel guitar and it’s a gorgeous clean sound. 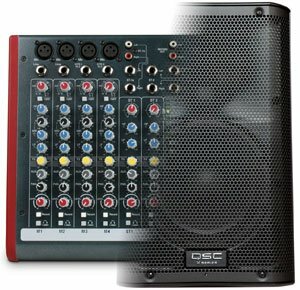 The PA I’ve been running for a couple years now is a pair of QSC K10 powered loudspeakers and an Allen & Heath ZED10FX mixer. The sound is superb. It’s a bit much to haul around for some gigs, but 9 times out of 10, it’s worth it to have the tweak-ability and tone. There is no right answer when searching for the perfect ‘ukulele amp. Talk to as many people as possible, learn as much as you can, and try all the amps in the music store. What sounds best is probably best! Don’t get distracted by bells and whistles – especially if you’re shopping for your first amp. Get something simple and cheap to learn the ropes with. Then you can fork out for more specialized gear to fit your needs.